Ballard Seattle is a popular choice for many home buyers and like much of Seattle, has seen a strong sellers market over the past few years. Obviously that's good news for sellers but it makes for a tough market for home buyers looking to get into the Ballard neighborhood. If you are interetsed in Ballard Seattle homes for sale, or more specifically a Ballard house, here's an update on all the numbers you will need to give you a good idea idea of how the real esate market is doing in this Seattle neighborhood. I looked at the sales of Ballard single family homes (houses only, excludes townhomes and condos) over the 6 month period covering May through October 2017. For reliable real estate statistics, it is always better to look at larger time periods rather than focusing in on any single month. All data was take form the Northwest Multiple Listing Service (NWMLS). This update specifically looks at houses only. Separate updates for Ballard condos and townhomes will follow in sepatate posts. What's the average sale price of houses in Ballard? I looked at the sale price of single family homes based on the number of bedrooms. Not unexpectedly, as the number of bedrooms increases, so does the average sale price. 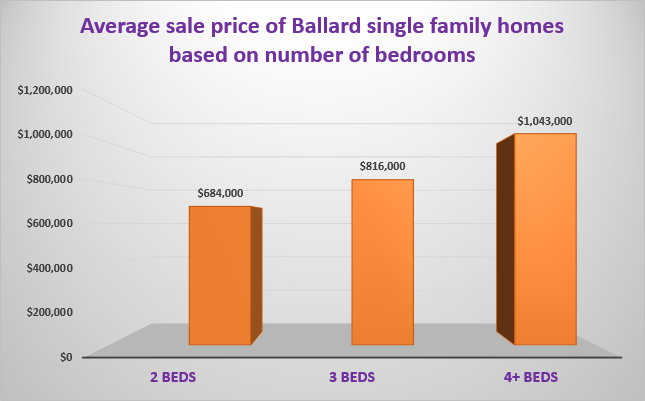 As shown below, prices averaged from $684,000 for 2-bedroom homes to $1,043,000 for Ballard houses with 4 or more bedrooms. Three bedroom single family homes sold for $816,000. How much are Ballard houses selling above list price? In a hot real estate market, there are usually multiple offers on most listings if the home is priced properly (don't get greedy!). This translates to the majority of homes currently selling above asking price. 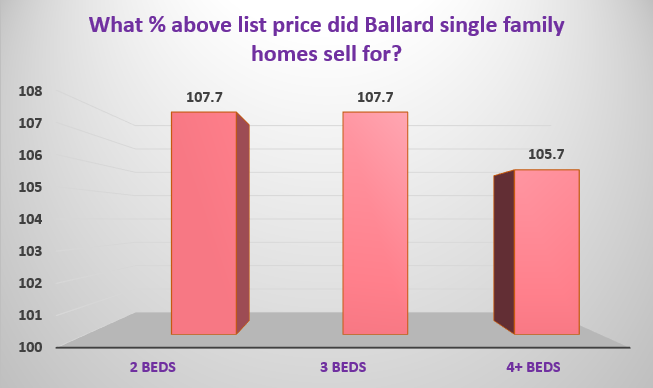 When you look at different sized homes (number of bedrooms), both 2-bed and 3-bed houses sold for 7.7% above asking price while the larger and higher end Ballard homes sold on average for 5.7% above list price. There is more competition for the "more affordable" houses (it's all relative I suppose) and hence you would expect to see those homes to sell for a grater percentage above list prices. How long do houses in Ballard Seattle take to sell? In general, when a home is listed for sale in the Seattle real estate market, it will hit the market on a Tuesday or Wednesday. There will be an open house at the weekend and then the seller will review any offers that have been submitted on the home on the following Tuesday or Wednesday. Since most homes are selling quickly, you would expect the majority of Ballard homes to sell within that offer review deadline, i.e. within about a week. 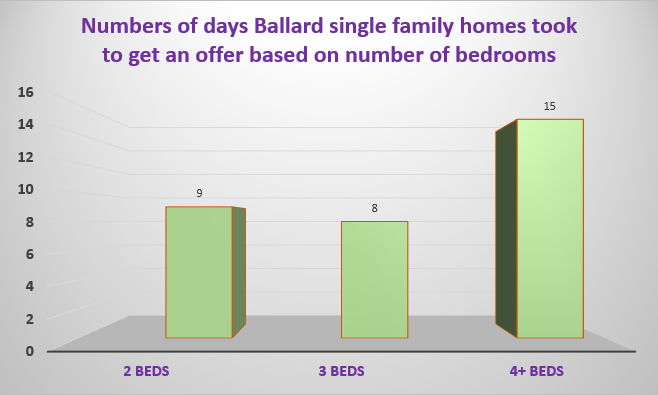 The graph below shows the number of days Ballard single family homes took to get an offer / sell. Both 2-bed and 3-bed houses sold within 9 days but more expensive, larger homes with 4 or more bedrooms took 15 days. In this market you don;t have a lot of time to decide whether you want to make an offer on a home or not. Plus in many cases, you may have to do a pre-inspection of the property to make your offer more competitive which means you may need to decide even more quickly. 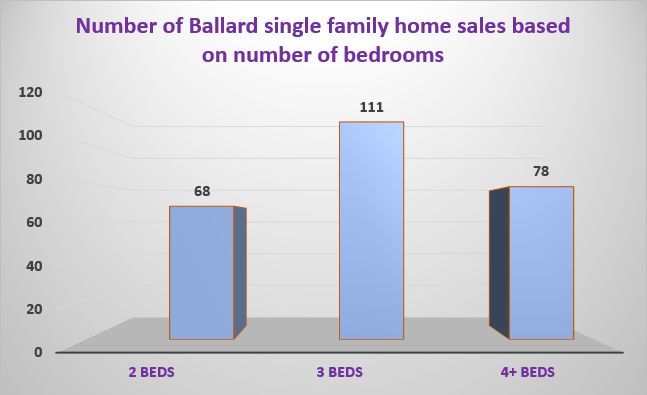 For the Ballard real estat market, what percentage of houses are 2-bed, 3-bed or larger? Because of rising Seattle home prices, most first time buyers looking to buy in Ballard will be focusing on the relatively more affordable and smaller homes, like 2 and 3 bedroom houses. So, it would be good to know what your chances are of finding a 2-bedroom or 3-bedroom house. Below is a breakdown of the number of sales of houses with different numbers of bedrooms that sold over the 6 month period from May through October 2017. A total of 257 houses sold. Three bedroom single family homes were the most common and accounted for 43% of all sales. Two bedroom houses made up 26% of sales and houses with 4 or more bedrooms were 31%. What's the overall trend for the Ballard real estate market? After bottoming out post 2007 bubble in the spring of 2012, Seattle and Ballard home prices have been steadily increasing. Currently, there is no sign of prices slowing down, but they will definitely do so at some stage. We can't sustain this market for ever. Everything goes on cycles. The plot below show how houses prices have trended over the past 5 years (using a 6 month rolling average). Prices have doubled over that time! Ballard single family home prices are, on average, up form $681,000 in October of 2016 to $770,000 in October of this year, an increase of 13%. Move your mouse over the chart to see prices for different times. To summarize, the Ballard Seattle real estate market is still firmly a strong sellers market with currently, no sign of the market slowing down. The continued chronic low inventory of homes for sale has only increased the competition for Ballard homes, pushing prices upward. Potential sellers are staying put and probably only selling if they are leaving the area or have the resources to buy their next home before they sell their current home. They don't want to end up without a home and competing with all the other other home buyers. It's a real Catch-22 situation. Buyers need to be really perseverant if they want to buy a home in Ballard. Hang in there and you will get there eventually or you might get lucky and hit a homer at your first at bat! If you have any questions about Ballard real estate, feel free to contact me. I've lived in Ballard since 2002. It's a great neighborhood! Click here for my contact info.